I know, they sound nasty, but hang in here with me. You won't be disappointed. First, let me fill you in on Aunt Evelyn. She was my Great Aunt, married my Grandpa's brother. They were so much fun, never had kids, and they came to visit us every summer for the Bix Beiderbecke Jazz Festival. Uncle Paul had been a musician back in the 30's and 40's. They were very special to me because my Grandpa passed when I was pretty little, and I was always around in the summer to hang out with them at the Bix Fest. This is her recipe, and it is classic 50's food. I am sure they ate this over rice for dinner, but it is one of my favorite things to make as appetizer. It sure beats Costco meatballs, and you know who you are out there, buying those! I always make more, meatballs are so time consuming, and freeze them for later. Scott's favorite pizza is ham and pineapple, so little tiny meatballs would be perfect for his pizza. Sounds like a blog for a cold winter's night! I run the meat through the grinder attachment on my Kitchen Aid mixer, and mix it well. Form meatballs, keeping them uniform size. I like them one-bite size, and I did make some little ones. Bake in a well oiled cookie sheet at 350 for about 30 minutes. Roll them about frequently, and baste with the sauce a couple of times. 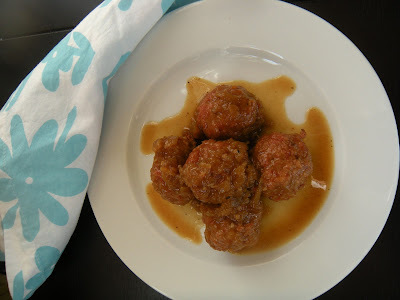 Heat sauce to melt sugar, and place the cooked, drained meatballs and the sauce in a casserole and bake 15 minutes, add drained pineapple chunks and bake 15 minutes more. Now, confession time. I make this recipe, as is, and the men especially eat it up. But while at work one day, we were sampling a sauce we sell called Tiki Pork. It is a pineapple based sauce with a little heat in it, courtesy of a little ginger and red pepper. Not necessarily spicy, but a little residual heat, and darn if it isn't good. So I bought this sauce for my Aunt Evelyn's Ham Balls and served them at our New Year's Eve party. They were fantastic, and I will tinker with my recipe to recreate this updated taste! Happy 2012! So long to 2011, on to the New Year!